Small batch distilleries are a hot trend across the US. Much like the craft-beer movement has introduced Americans to regionally made brews, micro-distillers that produce spirits such as unique-tasting whiskey, vodka and rum are bringing handcrafted sprits to American palates. Sugar House Distillery is among one of only a handful of legal distilleries in Utah and while that number is low, compared to most states, it is sure to rise as the popularity of micro-distillers increases. 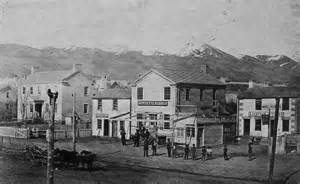 Utah has a very old distilling heritage dating back to the 1800's. Utah was one of the last states to pass legislation regulating the manufacture and consumption of alcohol in 1919. Not only was regulating drinking difficult, but, as Grand County officers discovered, stopping its illegal sale was also challenging. In 1923 Utah’s attorney general claimed that drinking in the larger cities was just as bad as before prohibition. Huge profits from the manufacture and sale of liquor made it impossible to stop. In Milford, Beaver County, officials alleged that the chief bootlegger was the city marshal’s sister. In Sanpete County one bootlegger loaded whiskey in the pack saddle of his trained horse and sent it home over twenty miles of mountainous road. He returned in his car, and when officers stopped him on suspicion of bootlegging they found no liquor in his vehicle. One Salt Lake City mother kept a still going in the basement of her house while her husband was serving an eighteen-month sentence for bootlegging. More shocking, raids on speakeasies in Utah often netted off-duty policemen among the criminal drinkers. Overall, from 1925 to 1932 federal agents in Utah seized over 400 distilleries, 25,000 gallons of spirits, 8,000 gallons of malt liquors, 13,000 gallons of wine, and 332,000 gallons of mash. Yet this was only a small percentage of what was actually being produced as practically every community and every neighborhood housed an illegal still. December 18, 2013 – The number of distilleries in Utah nearly doubled on Tuesday when the state liquor commission granted licenses to two new Salt Lake County spirit-making operations. Sugar House Distillery, 2212 S. West Temple, and Beehive Distillery, 1745 S. Milestone (3000 West), are the fourth and fifth small-batch distilleries licensed by the state. High West Distillery has two licenses in Park City and Salt Lake City, while Utah’s Own in Ogden has the third. The liquor commission also approved a package agency license for Sugar House, which means consumers will eventually be able to buy the small-batch spirits at the distillery.